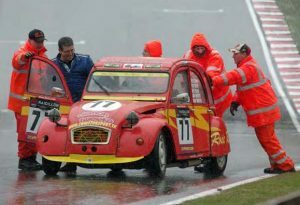 For the past 60 years the BMMC has been making sure motor sport events go off without a hitch. But it wasn’t always so organised as Michael Thorogood finds out. Mike Devine will never forget attending a scramble at Beenham Park near Reading some 60 years ago. As a spontaneous 14-year-old, Devine had decided to spectate at the event with a friend – but they ended up getting a lot more than they had bargained for. This was the nature of marshalling in its founding days: spontaneous, unstructured and haphazardly organised. With few assessments of competencies, ex-drivers would often be roped in to take on roles such as flag marshal, whilst volunteers from the spectators would regularly fill shortfalls. Having made his debut in 1957, the same year as the British Motorsports Marshals Club (BMMC) was formed, Devine can lay claim to being one of Britain’s longest serving marshals. 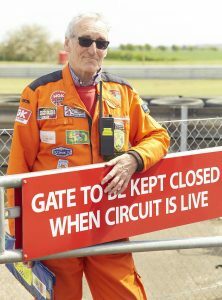 He continues to marshal as a 74-year-old and has seen the club grow from humble beginnings to become the largest marshalling organisation in the world. Each year the club’s orange army of volunteers provide an astonishing 40,000 marshalling days across the country, but as national secretary Steve Woolfe explains, the club’s early days were beset with challenges. “Unfortunately the club hit a financial crisis immediately on formation and had to be bailed out by John buying the club’s entire stock of regalia! The next major hurdle was to gain acceptance by the then governing body, the RAC, who were reluctant to register the club for fear of it becoming a ‘union’ of marshals. Woolfe began his own marshalling career on a very wet Good Friday at Oulton Park in 1974, at a time when the club was in its infancy. Although the club has grown in size and scope, with a National Council devolving responsibilities to seven Regional Committees and the British Rally Marshals Club, he explains how the job of the club’s 2,200 members remains unchanged. also make up the club’s cohort. Most offer their time and skills for free to do what they love and to benefit from unprecedented access to the sport. For one of the club’s newest recruits, Keeley McCarthy, becoming a marshal was the best way to get involved in motor racing. “We are not all destined to be race drivers, so I decided to research alternative options within motor sport,” she explains. “It’s the hands on involvement and flexibility to suit work/home life balance that appeals. Having begun her own marshalling career at an Oulton Park taster day in 1997, Nadine Lewis became the first female national chairman of the BMMC last year. She now spends her days ensuring marshals are represented in decision-making about the future of the organisation but makes sure she still gets her hands dirty on a regular basis. “I still get a buzz being trackside and getting stuck in and will continue to do so around my role as Chairman. Being at ground level gives me first hand experience of issues but more importantly helps me meet our members and potential members. Seeing people learn and upgrade gives me a particularly good feeling. 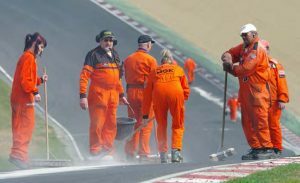 British marshalling has come a long way in 60 years, but the allure for many marshals remains unchanged. Indeed, more than half a century on, it is access to top-class sport and the knowledge that marshalling keeps the show on the road that keeps veteran marshal Mike Devine coming back for more. “My favourite marshalling memory is Silverstone 1987,” he says. “Nigel Mansell stopped right in front of us and kissed the ground after winning the race. There was far more access in those earlier days. I used to walk in the pits, we’d get dragged into the parties after the race and we’d meet all the drivers.